When going out with my now 10-month old son, I prefer to carry as little with me as possible. One excellent product that I would highly recommend is called the Skip Hop Canvas Pronto. It is a compact changing pad with compartments. 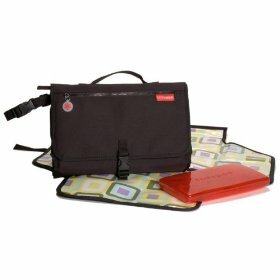 It has an outer zippered pocket and inner pockets for wipes and diapers. The changing pad has some soft padding on one side for the baby’s head. This is one of the few baby products that I use multiple times every day. Recently, the zipper on the inner pocket broke. I wrote an email to the company to see if I can get a replacement, and got a very quick response. They emialed me a shipping label and a form to be filled out and shipped to them with the defective product. It sounds like I should be getting a free replacement in 2-4 weeks. So far, the customer service at Skip Hop has been great. I will write an update once the transaction has been completed.